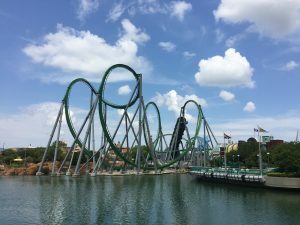 Day two of our escape from reality, and we went to Islands of Adventure. As you know, John and I took a small vacation before we go to Black Mountain, NC to have our annual family reunion, which is gonna be all kinds of crazy. Today we were kids again. 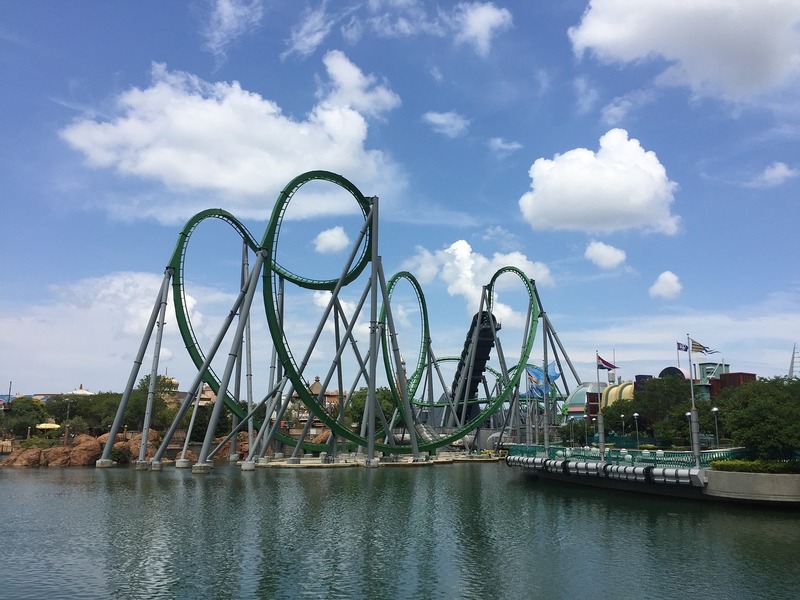 For those of you who don’t know, Islands of Adventure is the part of Universal Studios that has all the cool rides. By staying at a Universal Studios hotel, we were given Express Passes, thereby allowing us to go to the head of the line on most rides. So, while the unwashed masses were waiting in long lines in the heat, we were allowed to go into a different, shorter, line and were sometimes in and out within 10 minutes. Cool. My 25 year old son, Matthew, called this “white privilege” in a text he sent to us. So not. We paid for this privilege when we set up our reservations to stay in one of their charming, yet expensive, hotels to begin with. Anyway, we flew behind Harry Potter as he led us away from untold danger, encountered King Kong in Skull Island, rode The Hulk into submission, and fought bad guys with Spiderman as well as taking a long, plunging, watery fall through the mouth of a T-Rex in Jurassic Park. We were kids again. At least for the day. I’m not gonna lie, the Express Pass saved us many hours, call it white privilege if you want, that thing was magic. And I’m half-Asian by the way. The longest wait we had was at Dudley Do-Right’s rip roaring falls, and that’s only because they temporarily shut down the ride due to lightening in the area. We were next, so we decided to wait it out. In the meantime, I learned one employee suffered from social anxiety disorder (he looked nervous, so I asked why), and one pleasant employee told me all about herself. She hates sunscreen, for example, but it doesn’t matter because she is dark skinned and never burns. I, too, hate sunscreen. Alas, I burn. When we finally rode the falls, I emerged soaked to the skin, so John said we’d call it a day. We went back to our hotel where I promptly stripped, put on a hotel-provided robe and my orange bunny slippers, and am now Hugh Hefner in an overstuffed chair telling you about my trip back to childhood. I’m steering John towards a “sit by the pool” day for tomorrow. Hate sunscreen though I might, I need to tan my vampirishly white legs and face before we go to the mountains. Semantics. Though we live in South Florida, I never leave the house when I’m home. It’s not safe out there. Florida drivers are crazy, for one thing. Instead, I shuffle around my cold house (John likes it cold, he’s from New England) in sweatpants and slippers trying to drum up enough motivation to at least go to the grocery store once in a while. But no. John goes to the store, does the laundry, cleans the house and cooks dinner. He doesn’t understand my depression, but he does all this physical labor to make up for it. Right now it’s 10:45 pm, and he’s already asleep. I, on the other hand, have had pharmacy day and will be up until the wee hours trying obsessesivly to figure out how to fix my website so that it looks right. And, we all know what a tech genius I am. Plus, I’ll probably get sidetracked and wind up on Tumblr (like I did last night), or some obscure website that has nothing at all to do with what I’m trying to accomplish, which is build a good website. I’ll crawl into bed around five-ish, right when John is waking up for the day. Then, he’ll go to the gym while I sleep until noon. Until next time, stay strong and know that I care, and that I get it.